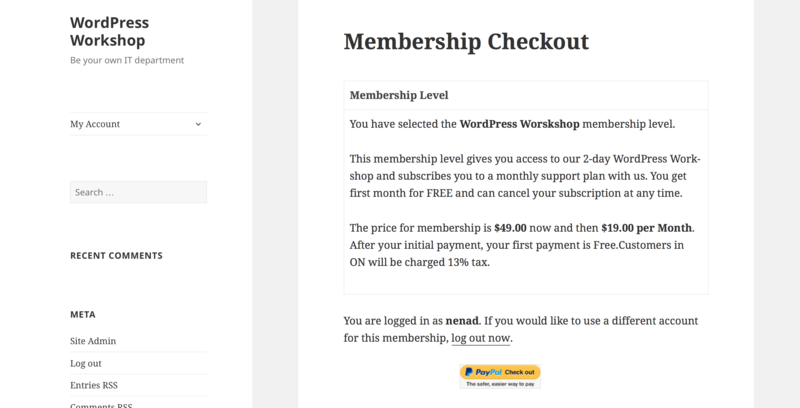 So, you’re ready to take your WordPress website to the next level, and build a membership website with WordPress. Building a membership website with WordPress requires installation and set-up on one of the third-party membership plugins. There are dozens of great WordPress membership plugins available, both free and premium (paid), and which one will work best for you will depend on the features you need for your website. For this tutorial, we only focused on free plugins, and choose the one that best meets our needs. The criteria we used for this choice is based on what we decided were the most important features for us. Paypal, Stripe, Authrize.net, custom, etc. 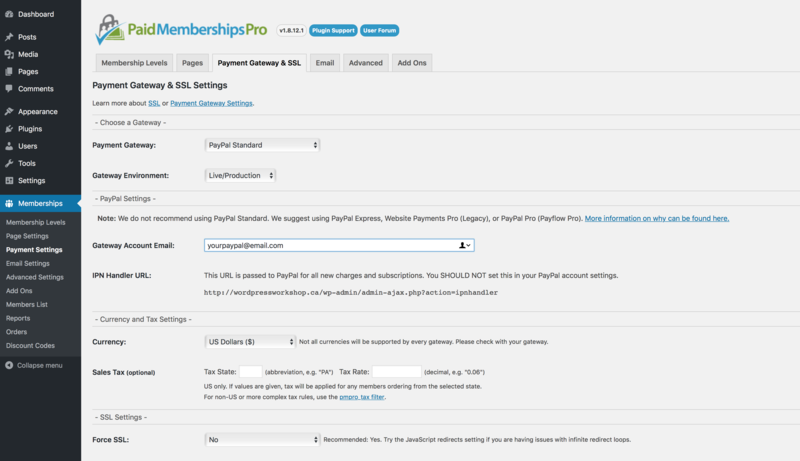 After spending some time playing around with dozens of different WordPress membership plugins, we decided that the best FREE plugin for our purposes (based on the criteria above) was Paid Membership Pro which can be downloaded via WordPress.org plugin repository in your website’s back end (see below for installation instructions). Let’s be clear. There is NO such thing as a FREE plugin. Most of the free plugins and themes for WordPress are stripped down versions of their premium plugins. The Paid Membership Pro has the most complete free version of their paid “Pro” plugin, which will give you everything you need to run a membership website. However, once you see the amount of additional features with their “pro” version of the plugin, you will be soon itching to have those options… But, I digr ess… Let’s go back to discussing what is available for free, and how to set it up to run your WordPress membership website. 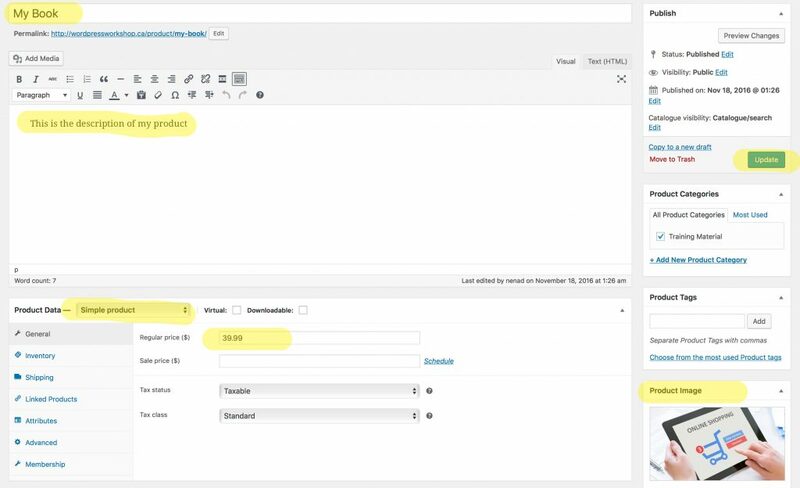 In your WordPress dashboard, click on the “Plugins” tab > “Add New“. 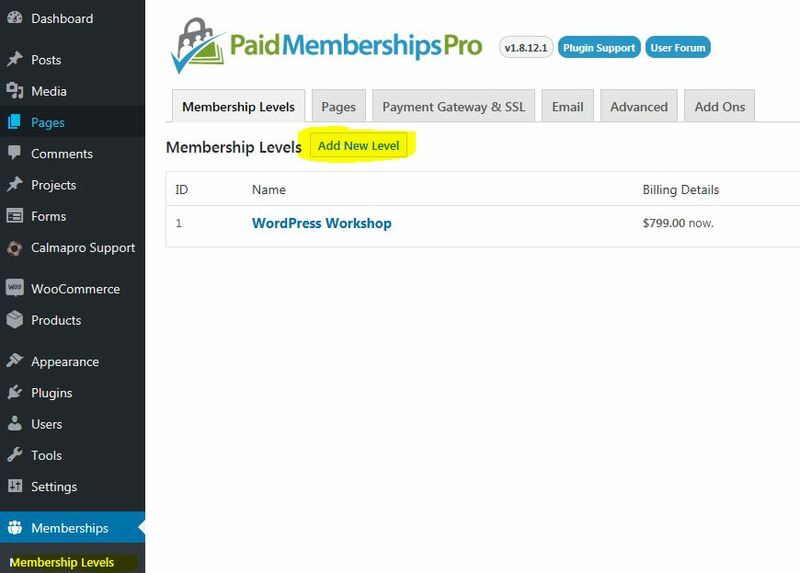 Free version of the Paid Membership Pro plugin allows you to create unlimited number of membership levels. That is a feature that is usually not found on free plugins (most of them will limit the # of membership levels you can create until you upgrade to a paid version of the plugin). Name – The name of the membership level. This will appear on the signup page and member’s account information. Description – The detailed information about the membership plan. It will appear on the signup page. Make it short and sweet, and clear what they are getting with their membership. Confirmation Message – A message that will appear on the screen upon successful registration for the membership. Billing Cycle Limit – limits how many times the automated subscription will run. If you set to 0, the membership will be infinite (the cycles will go until the member requests the cancellation). If you set a number, the system will automatically stop charging the renewals after the # of cycles you set in this box. For example, if you have set the renewal cycle to happen 1 per month, and the Billing Cycle Limit to be 6, the automated renewals will stop after 6months. Trial Billing Amount – you can also offer a “trial period” during which the member can pay either reduced or no subscription fee (used for promotions such as “Free 30 day trial). The following settings will set-up a monthly membership that never expires (unless the member requests cancellation), for $19/month, with the initial setup fee of $49 and the first month FREE (trial period). Membership Expiration – set an expiration timeframe (days, weeks, months, years). If selected, once a membership reaches this timeframe, it will be disable and any subscriptions will be cancelled. In the example below, the membership will expire in 1 year after the signup. Categories – In this section you can assign a blog category to a particular membership level. The list of all blog categories will appear here. By default they are all left unchecked. If you check any category, all the blog posts in that category will ONLY be available to the membership level for which you select this category. Paypal (Express, Website Payments Pro, PayPal Pro, Paypal Standard) – Only “Paypal Standard” is a FREE Paypal Service and no additional cost is required to set it up. This tutorial will show you the steps on how to set Paypal Standard as your primary payment method (remember, I said in the title of this blog “Create your WordPress membership website for FREE”, so I’m sticking to the FREE options only). Force SSL – unless you have an SSL encryption already installed on your hosting keep this as “NO”. It is not required for Paypal Standard payment processing. For any other Gateway, you will need to have an SSL encryption which has a yearly associated cost with it (unless your hosting company already includes it for free). The next step is to create custom members-only area (member’s account pages, front end registration pages, billing pages, etc.). Simply navigate to “Memberships > Page Settings” in your WP Dashboard, and click on the link “automatically generate pages”. All pages will be auto generated by the plugin. Now that you have set up your membership levels, registration and member pages, you can now start creating content restricted only to your registered members. 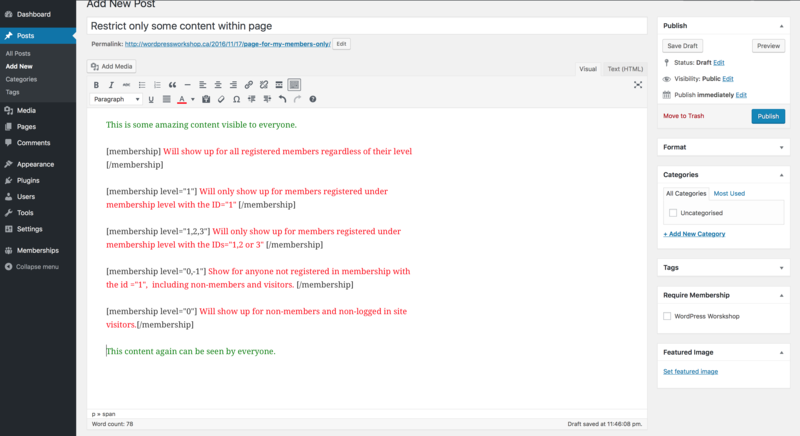 To restrict a whole page to be visible only by your registered members, please create a Page or a Blog Post and in the “Require Membership” box on the right side of the screen (near the bottom), select a membership level that should have access to the page. Integration with WooCommerce is one of many advanced lessons we cover in our 2-day WordPress Workshop. To unlock this tutorial, you can join our mailing list to find out more information about our WordPress Workshop (we will never share your email with anyone and will not spam you. You can also unsubscribe at any time). Enter your email below to unlock this tutorial. 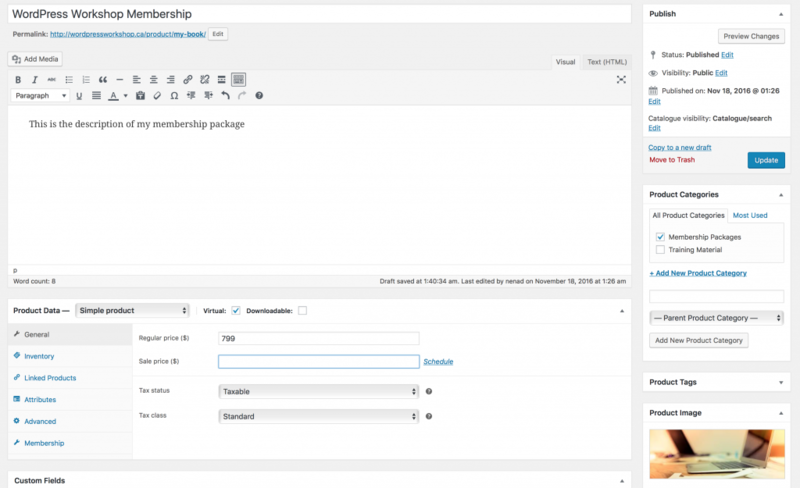 Navigate to “Memberships > Add Ons” in your WordPress admin navbar. 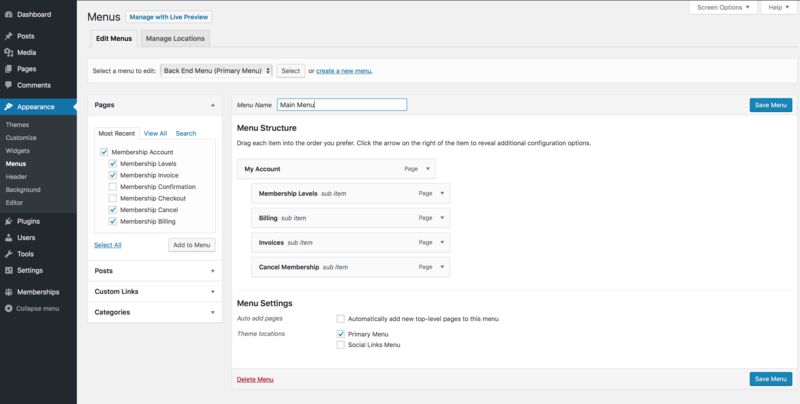 That’s it, you have now fully integrated WooCommerce with your Paid Memberships Pro Plugin. Finally, Under “Membership Tab” of the Product Data section, enter the price for this item for each one of your membership levels. (in our example, we only have one membership level, and they will be able to purchase the book for $19.99 instead of $39.00 which was set up as a regular price in previous step. Now, let’s create another product, this time, it will be used as a Membership Product. When your customers purchase this product, they will automatically be assigned a membership level with which you associate this product. This can be used ONLY for one-time membership sales, and not subscription products. Click “Publish” button, and you’re DONE! Congratulations! 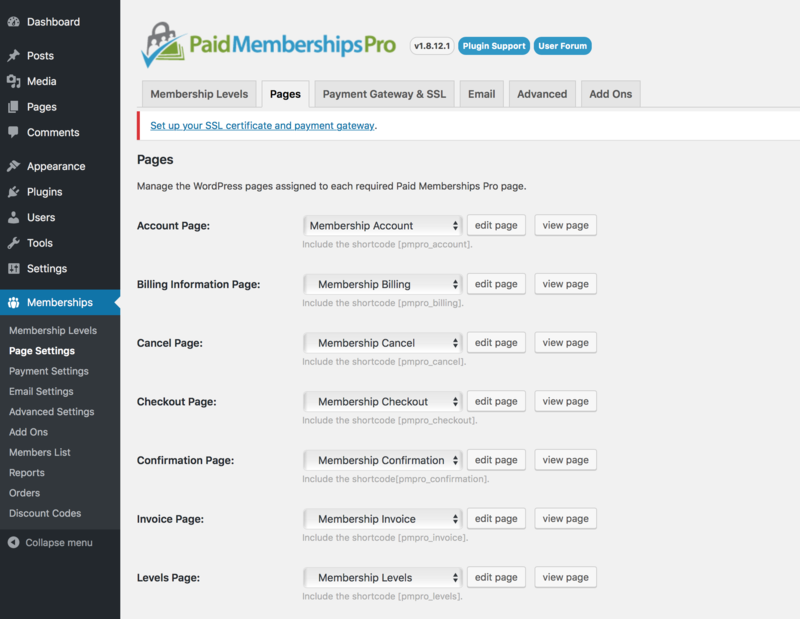 You have now fully integrated your Paid Memberships Pro plugin with WooCommerce. If you would like to learn more about WordPress, everything from setting up your WP-optimized hosting server and domain name to advanced lessons like this one, please check out our Online WordPress Workshop where we help you launch our online business with WordPress in just TWO DAYS! Join our mailing list to find out more about our upcoming 2-day WordPress Workshop and get instant access to this tutorial. We hate spam. Your email will be kept confidential and you can unsubscribe at ANY TIME! You can also integrate your membership website powered by Paid Membership Pro with email marketing softwares such as Mailchimp, Aweber, Constant Contact, InfusionSoft, etc.) using their FREE email marketing add-ons. This is one of many advanced and custom lessons we teach in our 2-day WordPress Workshop. Please check it out if you are serious about starting your online business in only TWO DAYS. Click here to find out more.